What Will The Spacesuits Of The Future Look Like? In A Word, Awesome. The modern spacesuit is a classic, but it can't be denied that it's a little bulky and in need of an update. Enter the Z-2, the new prototype spacesuit that could rule the future — complete with three new design options. The prototype is set to launch in November 2014, but before it does, the team over at NASA's Johnson Space Center has put out three separate design options — and they're taking votes over the next three weeks to see which one should move on. NASA/JSC is calling this one "Technology," but I believe I'm going to go ahead and dub this one "Tron" (for obvious reasons). Besides its awesome '80s retro-future aesthetic, the designers suggest that this one would be especially useful for spacewalks, given it's easily visibility and the addition of protective panels along the lower torso. This design "Biomimicry" takes its space inspiration from another remote, desolate landscape: the ocean floor. Based off of the scales and patterns of fish, this suit includes bioluminescent lighting (not unlike the Tron suit above), but in spindly patterns. It also features pleated seams, which the designers say would help with movement. 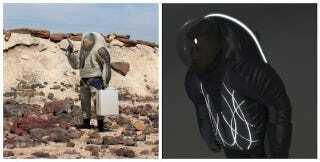 The final design assumes (wrongly) that spacewalkers of the future might want to embrace a more everyday look. Hence this sportswear-inspired design they're calling "Trends in Society." It's a valiant effort (featuring the same lighting and pleating features of the previous designs). But really, given the choice between looking like an '80s scifi icon, a space fish, or just some lady in a tracksuit who also happens to be on Mars, I know which one I won't be picking.